In less than two years as Attorney General, Jeff Sessions proved himself one of the most effective Cabinet members in advancing the Trump administration’s agenda, pushing through wide-reaching and hardline changes to the U.S. immigration system that will endure far past this presidency. Indeed, Sessions is leaving a parting gift: A major asylum reform, formally unveiled a day after the Attorney General stepped down, that could effectively close the Southwest border to people seeking refuge. Create a new, more difficult asylum application process for nationals who cross the U.S. border without prior authorization and whose country of origin is listed on a 212(f) “travel ban” proclamation that President Trump was expected to sign November 9. The few applicants who make it through the new, more difficult prescreening interview process will be referred to immigration court proceedings where they can only apply for withholding of removal (a nonpermanent promise by the government not to deport the beneficiary, that provides no path to permanent residency). In practice, any national whose country is added to the travel ban proclamation, widely assumed to include the three Central American countries from which significant numbers of families and unaccompanied minors have arrived in recent years (El Salvador, Guatemala, and Honduras) would be able at most to get withholding of removal, not permanent asylum protection. Sessions, who asserted an uncommonly vigorous role for the Justice Department in border-security and immigration policymaking more traditionally led by the Department of Homeland Security (DHS), submitted his resignation November 7 at the President’s request. The new asylum reform unveiled two days after the mid-term elections complements earlier steps Sessions took to reform an asylum system he has long characterized as riddled with “loopholes,” a term Donald Trump borrowed during the 2016 campaign. Trump borrowed far more than that phrase from Sessions, with a campaign immigration blueprint that owed much to the policies the conservative Alabama Republican advanced during a decade in the Senate and hiring former Sessions aides Stephen Miller and Gene Hamilton to shape and implement the administration’s immigration agenda. Notwithstanding their common purpose on immigration, Trump had a remarkably tense relationship with Sessions, faulting the Attorney General for recusing himself from overseeing the Russia investigation being undertaken by special counsel Robert Mueller. Despite his tenuous status in the administration, Sessions racked up a series of major actions touching upon numerous facets of the immigration system. Under his watch, the Justice Department increased prosecutions of illegal border crossers, no matter whether the migrants intended to apply for asylum, peaking with the “zero-tolerance” policy that so infamously separated thousands of parents from their children. Availing himself of the Attorney General’s omnipotent “referral and review” power in the immigration court system (which is part of the Justice Department), Sessions personally ended asylum seekers’ right to full evidentiary hearings, reversed decades of case law under which certain victims of gang and domestic violence were eligible to apply for asylum, and called into question the ability of asylum seekers to bond out of detention. revamped the immigration court system, implementing case-completion quotas and performance metrics on judges, and using his authority to strip away vital tools (such as administrative closure) judges used to manage their dockets. While much of the immigration bureaucracy once housed in the Justice Department was transferred to DHS, a new agency established in the aftermath of the 9/11 terrorist attacks, some of the tools the Attorney General had to exert direct influence over immigration remain in place today. In particular, the referral and review power, a device once used to resolve disputes on immigration within the Justice Department by authorizing the Attorney General to reach into the immigration court caseload and make judgments, has now turned into a political tool that an administration can use to reverse policies with which it disagrees. Armed with his experience as a former federal prosecutor and motivated by a decades-long drive to reform immigration, Sessions wielded this tool in unprecedented ways. While his decisions may not be enduring—a future administration with a different stance on immigration could reverse them—his use of the power certainly will be. Future administrations certainly will avail themselves of his example as a precedent, if they seek to push forward an immigration policy agenda. In the world of administrative decision-making in immigration law, the Attorney General is the final arbiter. He or she enjoys absolute power over decisions made by the immigration appellate court—the Board of Immigration Appeals (BIA)—because the BIA has no statutory authority of its own. Since the creation of an early version of the BIA in 1921, and its later legal enactment via regulation in 1940, it has always been a delegate of the Attorney General. Initially, Attorneys General wielded this power with great frequency: between 1942 and 1952, approximately 37 cases were reviewed on average annually. However, as federal courts reviewed more immigration decisions, immigration case law developed and regulations changed regarding when and how the referral and review power could be used. As a result, reviews dropped in frequency. Between 1953 and 1956 the pace fell to about eight cases per year. And under President Dwight D. Eisenhower, Attorney General William Rogers issued just ten reviews between 1958 and 1961. Since 1940, three entities have had the ability to refer cases to the Attorney General for review: the Immigration and Naturalization Service (INS) (disbanded and rolled into DHS), the BIA, or the Attorney General him/herself. Before 2003, the referral and review power was largely used as a dispute-resolution mechanism within the Justice Department, with BIA or INS referring cases to the Attorney General whenever one body disagreed with the other. However, since the creation of DHS in 2003 and its absorption of most immigration functions, the use of the referral and review power became one of few direct tools the Attorney General could use to influence immigration policy. And that reality is evident in the recent patterns of referrals: once the dust settled on the reorganization, every review has been one the Attorney General, not the BIA or DHS, referred to himself. Referral and review is no longer used to resolve disputes within a department, it is exercised to exert administration-wide influence over the future of U.S. immigration policy. And Jeff Sessions not only carried on the tradition, he took it to a new level. During the entirety of the George W. Bush administration, just nine cases were self-referred; the number fell to four during the presidency of Barack Obama. In his first year, Sessions referred eight cases to himself. Sessions concentrated his use of the referral and review power on two areas: narrowing who qualifies for asylum, with a particular focus on asylum seekers arriving at the U.S.-Mexico border, and limiting use of docket-management tools by immigration judges, with the aim of speeding immigration proceedings (and thus increasing deportations) in a massively backlogged system. 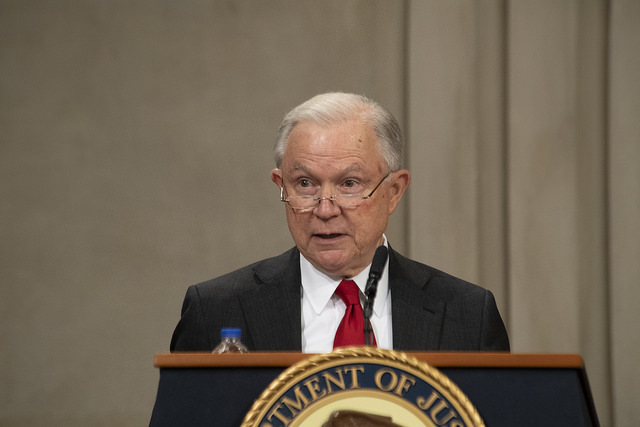 By limiting docket-management tools, Sessions effectively gave immigration judges no choice but to issue decisions on cases, stripping them of their ability to defer or terminate a case without a final decision. Using the Matters of Castro-Tum, S-O-G- & F-D-B-, and L-A-B-R- cases, Sessions greatly diminished the ability of immigration judges to administratively close, terminate, or dismiss immigration proceedings, or to grant continuances when respondents pursue parallel immigration benefits before DHS. These tools had been used by judges to pause removal proceedings while immigrants pursued immigration benefits, giving them the chance to stay legally in the United States, or even to provide informal relief to immigrants with sympathetic cases who did not qualify for legal forms of relief. In the wake of his decision in Matter of Castro-Tum, DHS issued a memo to ICE attorneys, advising them to put back on the immigration court calendar more than 330,000 cases that had been administratively closed by judges. This decision pushed the immigration court backlog, where cases can take several years to complete, past 1 million cases. These moves came on the heels of other Sessions initiatives to increase the speed at which immigration judges work through cases, including by setting annual case-completion quotas, performance metrics, and memos pushing judges to limit the use of continuances. In the decision that perhaps garnered him the most attention, Matter of A-B-, Sessions sharply limited instances in which applicants fearing domestic or gang violence could claim asylum—weighing in on decades of evolving case law on who qualifies for asylum. It particularly affects the viability of asylum claims made by many Central Americans, who often cite those grounds. His decision was issued in June 2018, just as the administration was separating thousands of migrant families in an attempt to deter future arrivals of Central American asylum seekers. In Matter of E-F-H-L-, Sessions reversed a decision that gave applicants for asylum and withholding of removal the right to a full evidentiary hearing. The decision opens up the possibility that judges could issue summary denials on asylum without hearing testimony—likely a tempting proposition when many are already under immense pressure to speed up their decisions. Sessions stepped down before he could issue decisions on two other cases he had referred to himself. In Matter of Negusie, he was weighing whether to further limit asylum. Applicants who have a history of engaging in persecution are barred from receiving asylum under current U.S. law. But if the applicants can prove they were compelled to assist in the persecution, they may not be barred. Sessions indicated he would be reviewing this “duress” defense. Finally, Sessions also referred two cases to himself that would allow him to issue a decision on whether judges can hold bond hearings for detained asylum seekers. After an initial case Sessions had referred to himself in September, Matter of M-G-G-, was rendered moot because the respondent in the case was removed to Guatemala, the Attorney General plucked a different case for referral, Matter of M-S-. In so doing, he provided further proof that the referral and review is more about shaping overall policy than resolving legal disputes that have naturally arisen through the adjudication process in individual cases. The next Attorney General will likely issue decisions on the Matters of Negusie and M-S-. Sessions also initiated a regulatory process that would vastly expand the referral and review power. Currently the Attorney General can only review cases that have been decided by the BIA. The Justice Department is working on regulations that would expand the Attorney General’s reach to cases pending before the BIA, as well as cases decided by immigration judges but not yet appealed. This would increase the cases on which the Attorney General could rule by more than 600 percent: from an average of 33,000 cases per year to 215,000. Significantly, the notice of the coming regulatory changes indicates it will only be expanding the Attorney General’s power to refer cases to him/herself, and not include a similar expansion for DHS or the BIA. According to the most recent update from the administration, the regulations are due to come out in March 2019. There is little doubt that the hardline immigration initiatives Sessions oversaw will continue throughout the remainder of the Trump administration, particularly with protégé Stephen Miller remaining a stronghold in the White House. But even after this administration leaves, the Sessions influence will persist—even if a successor reverses all of his referred decisions. This has become an increasingly common practice since the transformation of the referral power in 2003: half of the referred Attorney General decisions during the Obama administration simply reversed decisions made under President Bush. But it is unlikely that any future administration will be motivated to roll back the precedent of actively using the referral and review power for policy ends. Thus Sessions’ enduring legacy will be transforming a quasi-judicial system designed to provide due process to foreign nationals facing deportation into an outright and powerful political tool.